The Karachi Port Trust (KPT) has announced that Aedas is the winner of an international architectural competition for the design of a new landmark waterfront development in Karachi, Pakistan.The mixed-use project will be the first such landmark building built in Karachi Port. The scheme has two aims: to act as catalyst to some major regeneration initiatives planned for the port by KPT as it develops its land bank; and to provide a new landmark for this new Commercial Business District by the waterfront. Endorsed by Pakistan’s President General Pervez Musharraf, designs also include residential, retail and conference facility space in addition to its core commercial facility.The distinct form will be an instantly recognisable symbol. 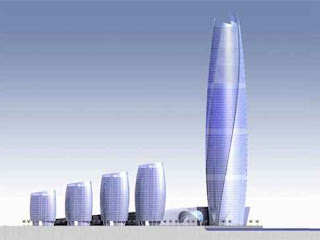 It responds to ecological concerns to reduce carbon footprint, setting a precedent in Pakistan for environmental building standards though the use of passive design principles and techniques of environmental control.At the centre of the development is an 80 storey helical tower with glazed outer skin. This will house 102,000 sq m of office accommodation, on top of which will sit a 250-bed 5* hotel across the top 21 storeys. The hotel will also include 30 luxury serviced apartments and a swimming pool, and give immaculate views over the Indian Ocean.Three further towers echo the design, each of varying heights, arranged around a lake. These will each include 280 serviced apartments with a further 70 apartments above 10,000sq m of high-end retail development. The scheme also features a 1,200-seat convention centre and exhibition hall and an underground 2,500 space car-park. 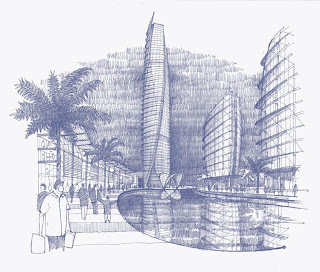 David Kingdom, project director comments:“Over the last six months we have worked to develop a concept design that satisfies an international demand for BCO standard office space and answer an extreme shortfall in 5* hotel and high class residential facilities identified by the Karachi Port Trust. Aedas is being assisted by MM Pakistan and Mott MacDonald UK & Dubai. The project is due to start on site in April 2007.